Our Volunteer Office sorts through piles of nominations from supervisors and honors one of our volunteers for each month to recognize their truly stupendous efforts. Meet our latest Volunteers of the Month! This month, we are announcing awardees from both October and November. One is a Marine Mammals volunteer and the other volunteers with Visitor Education. What do they have in common? Not only do they go above and beyond what is expected of them, but they also bring incredible positive energy to the Aquarium! Kim joined Marine Mammal department in July of 2012. When I first met Kim she was what I would describe as a bit on the shy side. It wasn’t long before Kim broke out her shell and became a part of what we refer to as our “Tuesday dream team.” These days, that shy girl I met in 2012 can be found teaching coworkers her oh-so-lovely jig that she loves to show off during our end-of-the-day dance parties in the kitchen. In addition to her enjoyable personality, she is an incredibly hard worker and always brings her best attitude to work. You can tell that she really appreciates the animals, and always goes above and beyond to make sure they have the best enrichment possible. 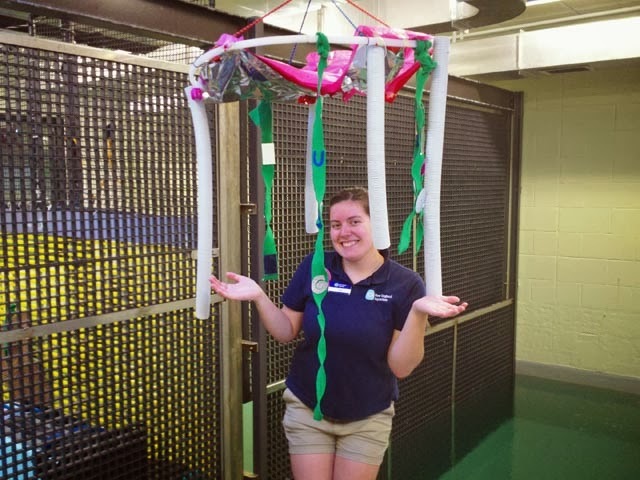 Kim even has gone so far as to spend her own time and money constructing a seal mobile that hangs from the ceiling for enrichment for the seals and sea lions. She spent a lot of time and energy looking into what the seals might most enjoy in this toy, mirrors, dog toys, car wash strips and even tubes to house different scents that the seals enjoy. 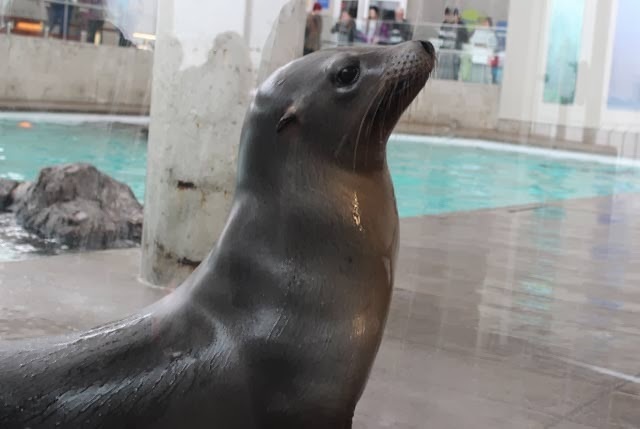 This toy has fast become a favorite of our sea lions in particular. Enrichment is an incredibly important part of the animals’ day, and having someone on our team that values it as much as Kim is an amazing asset to our department. I’d like to nominate Greg Lamoureux for volunteer of the month. Greg is always the first face I see when I come in in the morning, over an hour early for his shift, because he has to catch an early boat from Hull to be here on time. He always has a smile on his face, and is ready for whatever is put in his path. 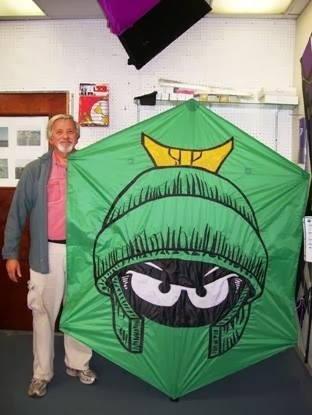 When other days are tight on volunteers, Greg is quick to come in and volunteer additional days to help out the team. He works a longer day than most of the volunteers, and never loses his enthusiasm for the Aquarium! Check back in January for our final Volunteer of the Month of 2013!